With the exception of first dates, there’s every reason to cram as much garlic as you can into your diet – and our Whole Garlic Clove Loaf is an excellent place to start. 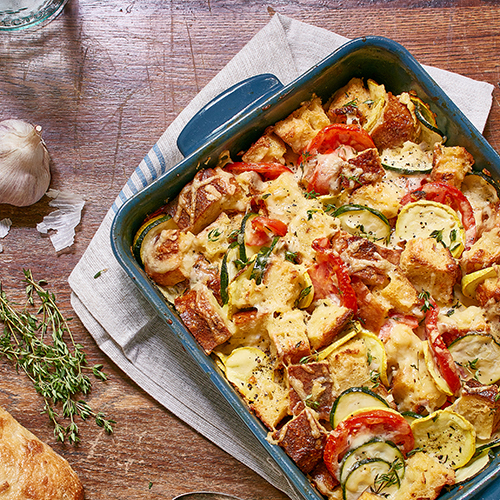 Garlic aside, if you’re keen to see how amazing zucchinis, tomatoes, shallots, eggs, milk, cream and Gouda cheese can taste when you work them right (with garlic…), then you’re going to be coming back for a lot more of this Summer Vegetable Strata. Don’t expect it to look like as it does in the image, it won’t last nearly long enough to be photographed. Pre-heat oven to 375°F (190°C). Spray or butter a 9 x13 baking dish. Whisk together eggs, milk, cream, thyme, salt and pepper. Stir in 1½ cups of gouda. Slice and cut bread into 1 inch pieces and transfer to a large mixing bowl. Add zucchini, tomato and onion. Pour in egg mixture. Gently stir to combine. Transfer ingredients to prepared 9x13 dish and sprinkle with reserved ½ cup of gouda. Bake for 40-45 minutes until golden brown. Tip * This can be prepared the night before for an easy morning bake.